All welcome, free entry, donations welcome. Cake & drinks available. 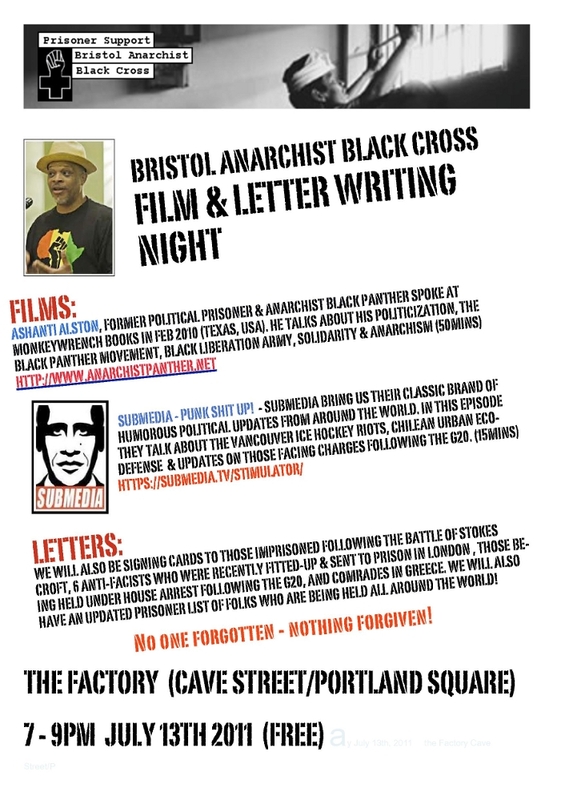 We will also be signing cards to those imprisoned following the battles of Stokes Croft, 6 anti-facists who were recently fitted-up & sent to prison in London (info & solidarity fund) , those being held under house arrest following the G20 in Toronto in June 2010, and comrades in Greece. We will also have an updated prisoner list of folks who are being held all around the world! No one forgotten, nothing forgiven! This entry was posted in Uncategorized and tagged anti-fascists, Black Panthers, Bristol prisoners, Canada, films, G20, Greece, resistance, solidarity, state repression, Stokes Croft, writing. Bookmark the permalink.